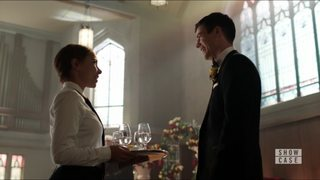 Who was this awkwardly excited girl at the wedding in Supergirl S03E08? She said she was excited for the wedding and then corrected herself and said "any wedding". I don't remember her mentioning her name but her reply to Barry was suspicious. Is this a hint of some important future character? Did she appear before this scene too? I mean it looks like a important hint for the future but what is it? 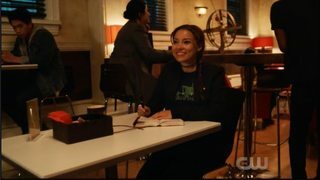 The girl has revealed herself to be Dawn Allen, the daughter of Barry & Iris although whether she follows the same story-line history as the comic version remains to be seen. 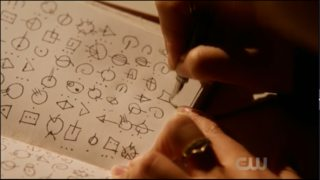 * - Which is likely since Jessica Parker Kennedy (who played the waiter/caterer) also appears in the season 4 "The Elongated Man Rises" episode and is writing in the same symbols as Barry used when he returned from the Speed Force. Dawn Allen was the daughter of Barry and Iris Allen, conceived in the 30th Century after her father's retirement, but born after his death in the first Crisis. She and her twin brother Don inherited a fraction of his speed. Since they never knew their father, they often felt jealous of their cousin Wally West, to whom Barry was a father figure. XS is a speedster and superhero in the 30th Century. She is a member of the Legion of Super-Heroes representing Earthgov in Reboot Legion continuity. Her grandfather is Barry Allen, also known as The Flash, which makes her part of the Flash Family. Her mother is Dawn Allen of the Tornado Twins, her father is the politician Jeven Ognats, and her cousin is Bart Allen. We now know that she is the daughter of Barry Allen and Iris West-Allen and her name is Nora West-Allen. She is named after her deceased grandmother Nora Allen who was killed by Reverse Flash. She is also a speedster and goes by the alias XS. She has both purple and yellow lightning showing characteristics of both her mother and father. Her name is different from the comics based daughter of Barry and Iris i.e. 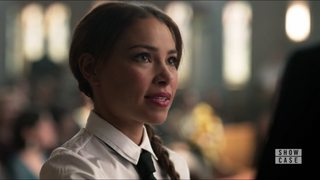 Dawn Allen. Dawn Allen is the twin sister of Don Allen and they together are known as Tornado Twins. We do not know anything about Don Allen till now in the TV series and also we do not know about the Date of Birth of Nora West-Allen. Not the answer you're looking for? Browse other questions tagged character arrowverse the-flash supergirl . What was the matter with GJ? What is the device Barry (The Flash) has on his chest in the Supergirl crossover? Why does the Supergirl TV series go out of its way to not say “Superman”? What's wrong with this Supergirl elevator pitch? How was Supergirl able to beat up the guards? In the Supergirl TV series what are known powers/abilities of the Martian Manhunter?